Sentinel of the sky: This is the incredible moment a U.S. stealth bomber is refuelled over the Cornish coastline. 44시간을 체공할 수 있으며 한번 급유(75ton)로 6000마일(9,600km) 비행한다. B-2 스피릿(B-2 Spirit)은 미국의 다목적 스텔스 폭격기이다. 스피릿은 1997년부터 운용하기 시작했으며 현재 20기가 운용중이다. 대당 가격이 세계에서 가장 비싼 비행기이기도 하며, 현재는 생산이 중단되었다. The state-of-the-art aircraft is rarely deployed outside of the U.S. The high-tech aircraft, which has a wingspan of 52-metres and can fly for as long as 44 hours, was photographed above Cornwall's picturesque northern coastline. It was performing a mid-air refuelling with a KC-135 Stratotanker from RAF Mildenhall. The image was captured on June 11 by Senior Airman Christine Griffiths and now released by the U.S. Air Force. The U.S. military said the B-2 was 'participating in familiarisation training operations' in the UK. Admiral Cecil Haney, commander, U.S. Strategic Command, said: 'This deployment of strategic bombers provides an invaluable opportunity to strengthen and improve interoperability with our allies and partners. The B-2-bomber photographed above Cornwall is assigned to 509th Bomb Wing, Whiteman Air Force Base, Missouri. Launched in 1997, the stealth bomber is one of the most recognisable aircraft ever launched and carries conventional and nuclear weapons. 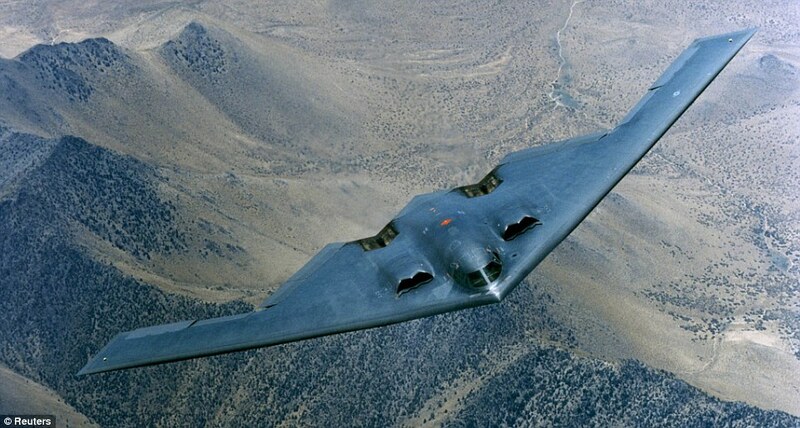 According to the US military, the B-2's 'stealth characteristics give it the unique ability to penetrate an enemy's most sophisticated defences and threaten its most valued, and heavily defended, targets'.